Providing you the best range of cutaway model globe valve with effective & timely delivery. Advanced Technocracy Inc. is Manufacturer, Exporter & Supplier of Cutaway Model Globe Valve. A cutaway globe valve with 3" inlet port. Cut away and fitted on a coated aluminium stand for hands on training on internal construction, operation, repair and maintenance. 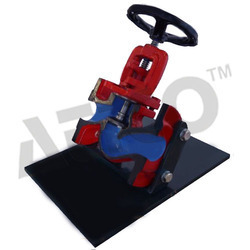 Globe valves use a disc and seat arrangement to control fluid flow. An internal baffle splits the inlet and outlet at the seat and the disc moves up and down into the seat to control flow. Globe valves are typically used for applications that are normally closed, because the internal baffles and valve shape prevents fully unrestricted flow. The series of cutaway globe valves uses brand new industrial globe valves that are cut away to clearly show the inlet, outlet, seat, disc, steam, cage and seat ring, allowing students to easily visualise valve operation and identify the main valve components. Looking for Fluid Mechanics Components in Piping Systems ?